A couple of weekends ago Andy and I spent a weekend away in Florence. We were incredibly lucky that Andy won the trip through his job, his hard work paying off. Whilst I was excited about going, I mean who wouldn’t want an all expenses paid for holiday, I was also extremely anxious. I had never left my girls before and I didn’t know how I would cope with leaving them. My wonderful parents offered to have them, there really is no one else that I could leave them with. I prepared them as best I could for us being away. Alice understood and was more than happy to spend the weekend with nan and grandad. Obviously Holly is a little bit too young to understand, but she adores my mum and I knew she would be ok.
After a frantic twenty four hours getting everyone packed and ready to go, it was time to leave. My parents arrived early on Friday morning, Alice had just woken up and Holly was still snoozing. I knew that Holly would probably be asleep when we left and whilst that was hard for me, it was probably best for her. As she woke up to nanny and lots of hugs. The drive to the airport was probably the worst part, as at that point I could still turn around and go back. But I didn’t, whilst I am a mummy to my girls and they will always come first, I am also a wife to Andy. It’s important that we spend time together and there hasn’t been much of that in the last four years. So, we carried on to the airport and boarded the plane. Andy had one job to do in preparation for our trip away, check us online and print the boarding tickets. He failed on both counts and I was doing it all at 9.30pm the night before. Which meant that we were not seated together, a great start to our weekend together. We got in the car and they whisked us away to our hotel. 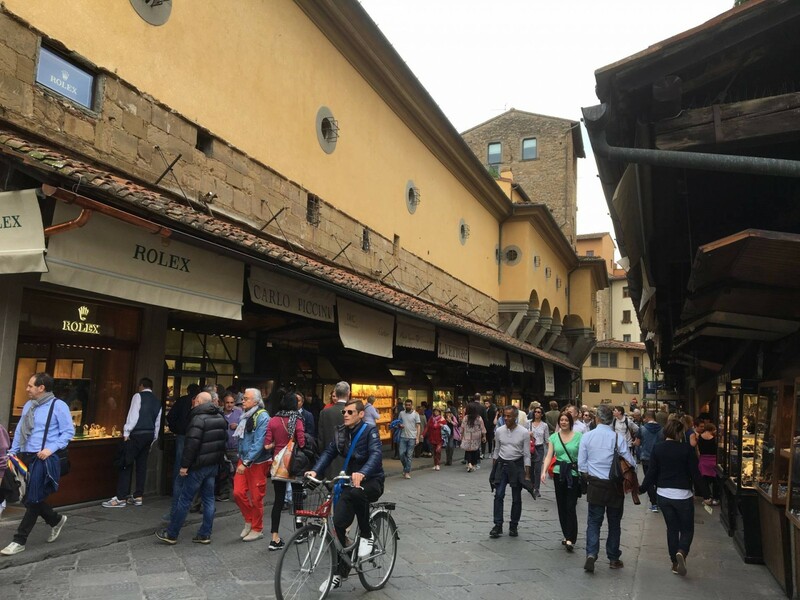 We stayed at a lovely hotel called Pitti Palace al Ponte Vecchio, which was based as central as you can get in Florence. I quickly hung up my clothes and we set off to see the beautiful sights. 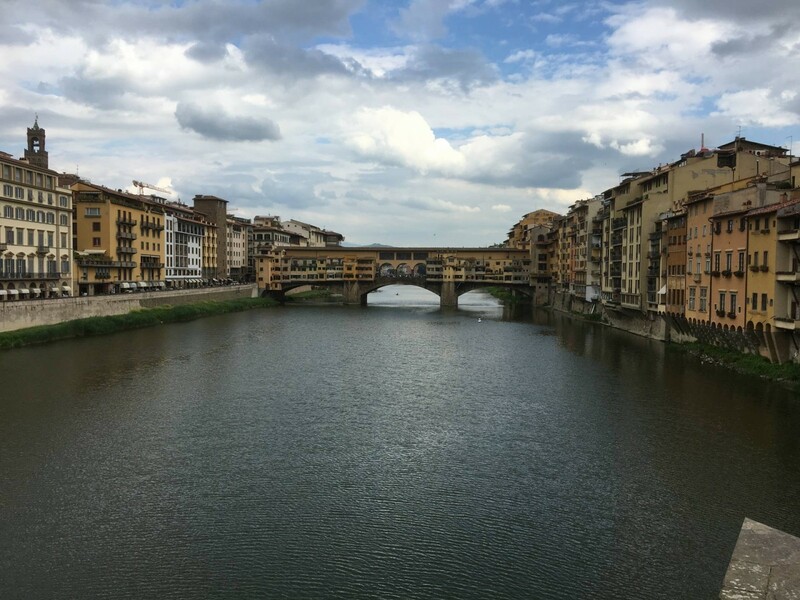 We strolled around soaking in the wonderful sights Florence had to offer and walked across the famous Ponte Vecchio bridge, only to discover at the other end was our hotel. We had walked a complete loop and ended up back where we started. But, at least we now knew our hotel was at the end of this bridge and we shouldn’t get lost. We found a lovely square to have an early dinner in and a beer. I was really tired by this point, having been up since 5am. So, afterwards to we made our way back towards our hotel and opposite was a cafe that sold the most amazing ice creams. We sat outside with a drink and an ice cream, chatted and watched the world go by. The next day we were up early, thanks to our body clocks being so used to it with the girls. 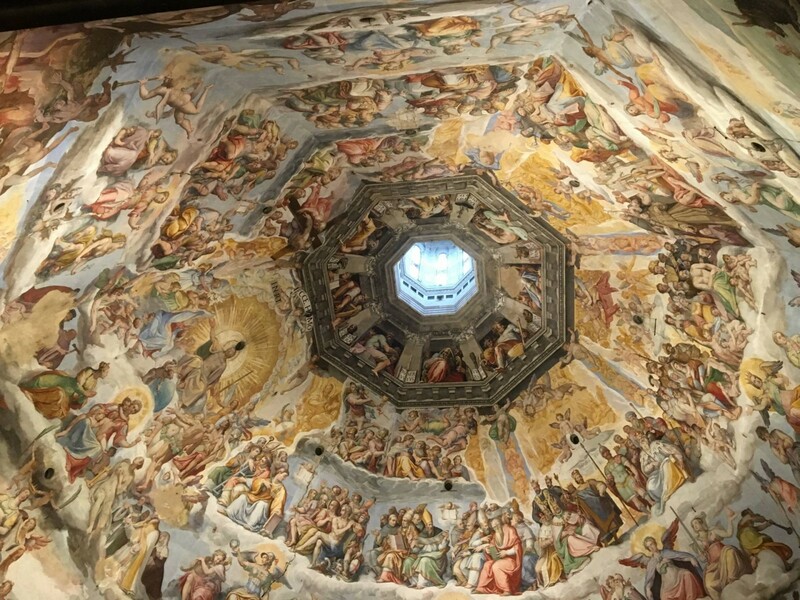 We made the most of it and headed straight out towards the Campanile di Giotto, the Florence cathedral bell tower. As we walked along the row of shops, they have every designer brand you can think of. I was making a mental note for the walk back…. Andy is scared of heights and normally waits at the bottom of places while I climb to the top. But, he decided he would climb up. Which he did and moaned about me not getting to close to the edge. By this point it had started raining and not just a drizzle, big fat rain with thunder. 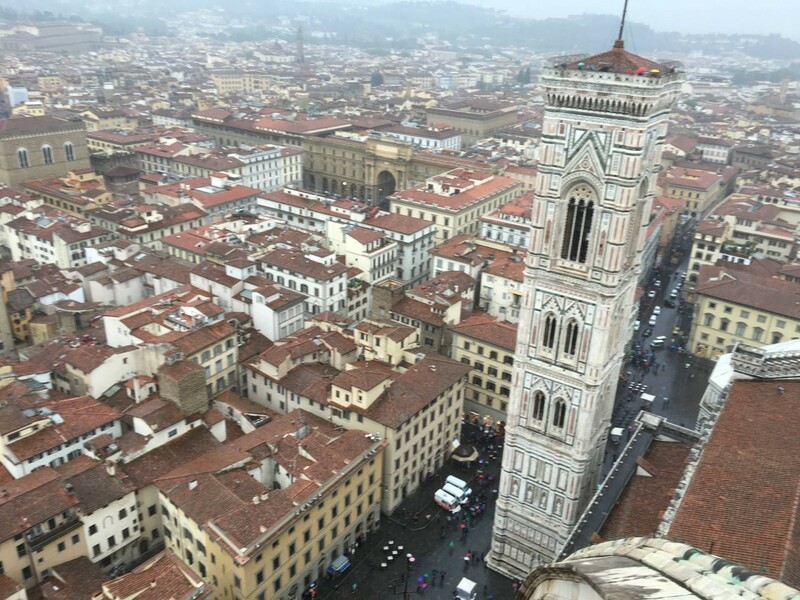 It was still raining at this point, but I really wanted to climb up Cupola del Brunelleschi, again Andy said he would come too. The queue was quite long, but we decided it was now or never. Luckily the queue moved quickly and we were soon indoors. As we started to climb up, I could tell that Andy was beginning to regret coming. 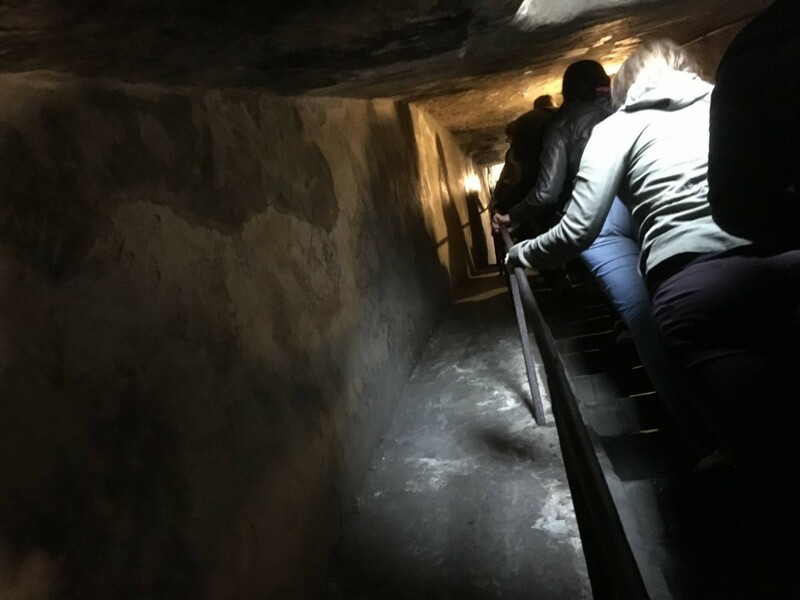 It was really narrow and there was a long way to go, 436 steps! At one point you go out of the staircase and into the temple and walk round it, it was beautiful to look at. But, for someone that does not like heights, we were very high up. You then go back into the staircase to continue the last part of the climb to the top. It is here that you can also exit, which Andy very quickly did! I headed on up and I was pleased Andy hadn’t come any further, as the roof starts to narrow off and he would not have liked it at all. The last bit was a vertical ladder and thats it, you are at the top. It was still raining as I climbed out and I was thankful for my umbrella. I walked round and took some shots of the views. Before heading back in for the climb back down. We then went and had lunch is a restaurant on the square. Before we had children we would have eaten lunch quickly and rushed off to see the next sight, but we decided that this break away wasn’t just about seeing the beautiful Florence. It was also for us to relax, not to be rushing around, not to be clock watching, all the things we do everyday at home. So, after lunch we sat and chatted for half an hour, it was lovely to just sit and talk. The rain then stopped, hooray! 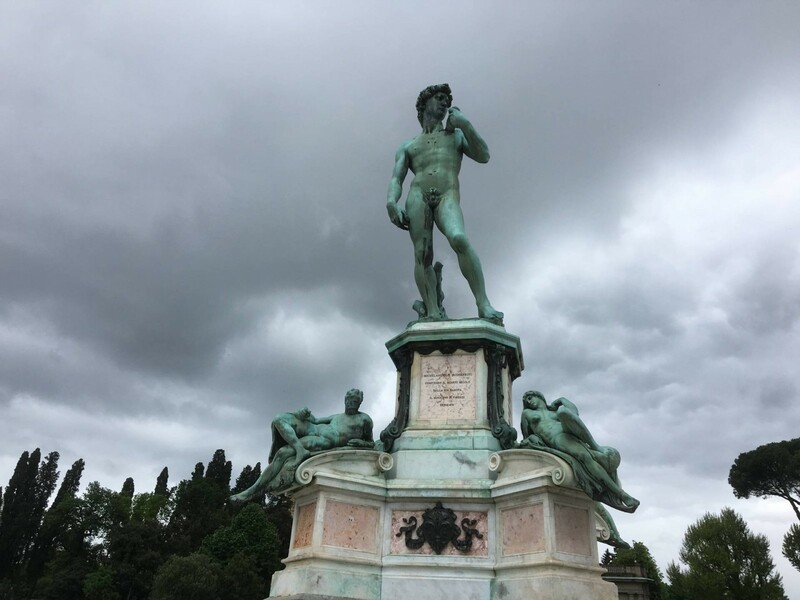 We headed of to find the Piazzale Michelangelo , we had to walk up a hill with a lot of steps. Oh my legs had a good workout this weekend, but it was worth it when we got to the top. 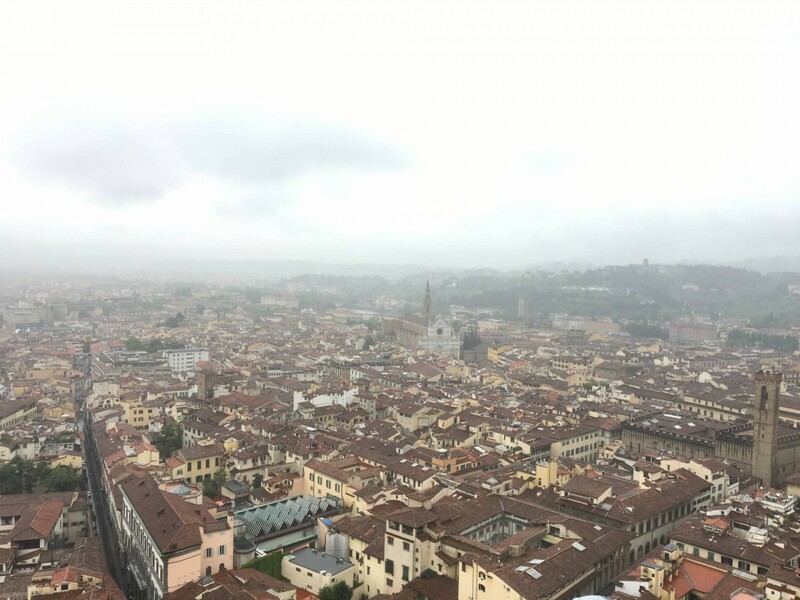 The views back across Florence were amazing, the pictures don’t do it justice because it was such a grey day. We then headed back down and back to our hotel to get dry and ready for dinner. We went back to one of the squares we had been to during the day, where we had spotted a lovely restaurant we fancied going to for dinner. 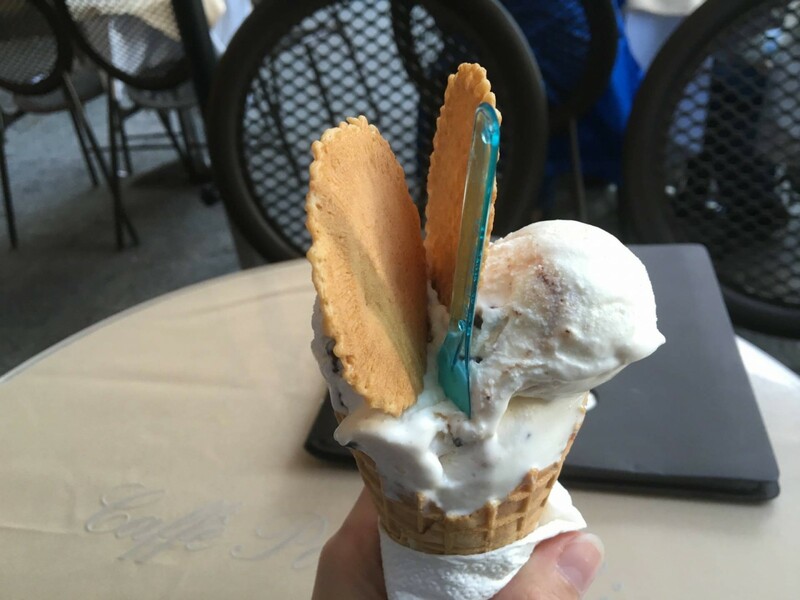 I just love the food in Italy and Florence didn’t let me down. After dinner we had a walk around, soaking it all in and stopped for an ice cream. I just can’t resist their waffle cones and ice cream, so delicious! The next day we didn’t have long before we had to head to the airport. We had a quick walkabout and stopped off for a coffee for me and a coke for Andy. We then hopped in a taxi to head home. We had a great time and I would definitely love to go back. But, I was so ready to see my girls and hold them close. After a nightmare experience of getting out of Heathrow airport car park, we arrived home. My babies were fast asleep, so we snuck into each of their rooms to see them. I placed my hand on the chest just to feel them…we were back where we belonged with our family. Our trip away made me realise that I am the type of mum that just likes to be with her girls, yes I might moan about it and yes, I do need time to do things for me. But, I also just love to be with them…my beautiful girls, who won’t be little forever and I want to spend as much time as I can with them. I could go for one of those ice creams right now too! I know, I don’t know what he was thinking!! Oh the ice cream, take me back now!! I loved it too, I adore Italy. Oh gosh this brings back so many memories of Florence! 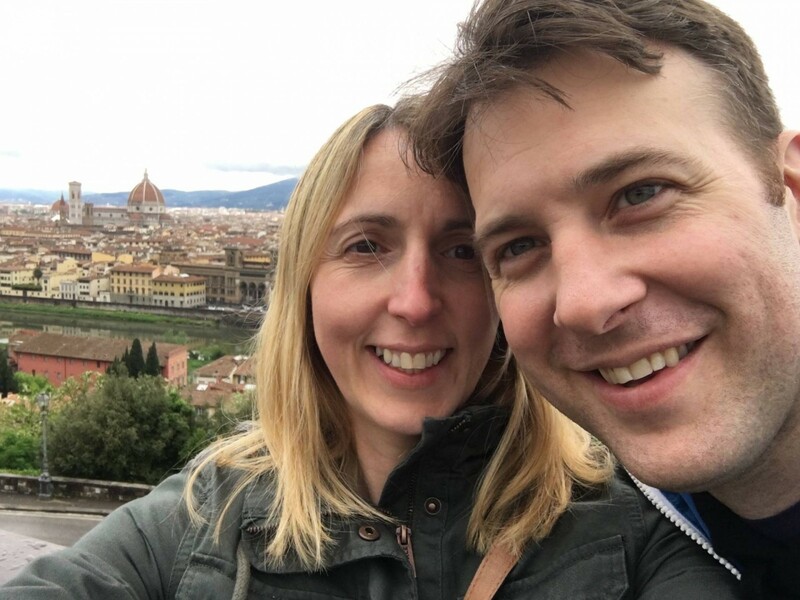 We went to a Wedding near Florence a couple of years ago and it was my first time abroad without my then 2-year old too. It’s so difficult to relax and enjoy yourself when your heart is at home – it does get easier though! What a fabulous time you’ve had. You have brought back some great memories for me too, I loved Florence. You are so right about being a wife as well, it’s something I could learn from, my poor husband is it’s very neglected. It did make me laugh that your hubby failed at his one job, mine would too! Florence sounds fabulous though, it’s definitely on my one day list! Oh wow! I really enjoyed this post – what a fantastic adventure! I’d love to visit there one day, although those stairs look scary! Yes, they were a tad scary but worth it! Looks like you had a lovely time but it’s great to get back home. We went to Florence for our honeymoon and it’s a great city. I’m exactly the same, I appreciate the need for time as a couple but I’m definitely happiest with my little ladies by my side. We’re going away for the first time since our youngest was born next month for our anniversary. It’s only a night and I’m looking forward to it but know I’ll miss them enormously.